It's tough to find women in Celtic music. That's what I learned when searching my library for music performed by women for Mother's Day. But I found some great Celtic music from The Gothard Sisters, FIMM, Bonnie Rideout, Dublin Harpers, Eilis Crean, Good Foot, Dearest Home, Sarah Copus, Burning Bridget Cleary, Solasta, Fromseier Rose, Beth Patterson, Searson, Emish, Plaidgrass. Our Top Irish & Celtic Music Spotify playlist is newly updated with many of your favorite songs from recent shows. You can follow the link in the shownotes to find that playlist and find other Celtic music playlists we recommend. The Arthurian forest of Broceliande is believed to be located in the heart of Brittany. The forest is rich in Celtic legends and holds the Tomb of Merlin, the Fountain of Youth and more. You can watch a video from my Celtic Invasion of Broceliande in 2017. A great way to help promote the podcast is with an Irish & Celtic Music Podcast sticker. We have two different designs. Get one in our store. Vaun's Photography emailed: "Just listened to podcast #351. First time listener via podcast addict on my Android. Thanks for your work to make the podcasts possible." 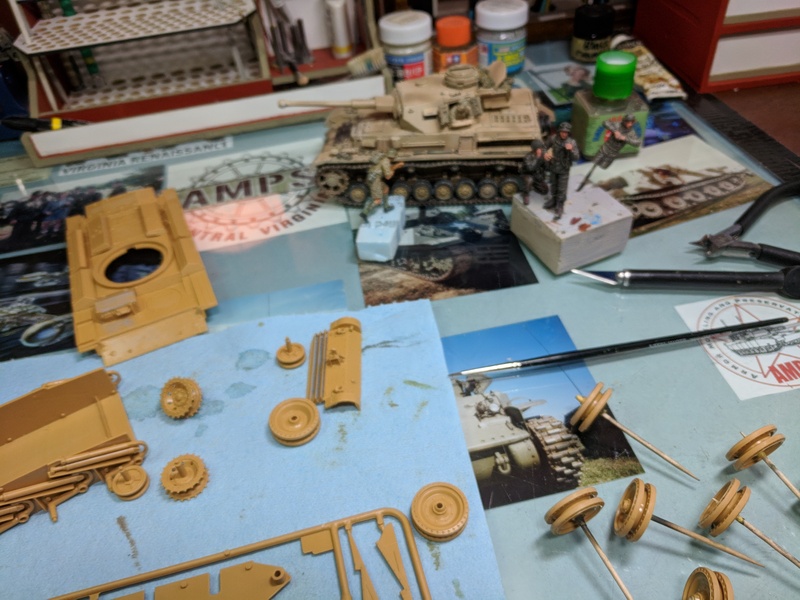 Frank Blanton emailed a photo: "Hey Marc, This morning I am listening and working on plastic model kits. I do Armor, tanks and figures from WWII here in Richmond Va. the capital of Celtic Culture in the Southeast! Here is a photo of my art desk. Thanks for all the great Celtic music!" Jason Youngberg commented on Patreon: "It was raining here in Chicagoland this morning making this a nicely named episode." Lane Rose emailed: "Hey Mark, I live in Northern Colorado, where It has been raining almost non stop for the last three days, and Rainy Day in the Celtic Nation made the perfect addition to this wonderful weather. Thanks for all the great music. Long time fan"